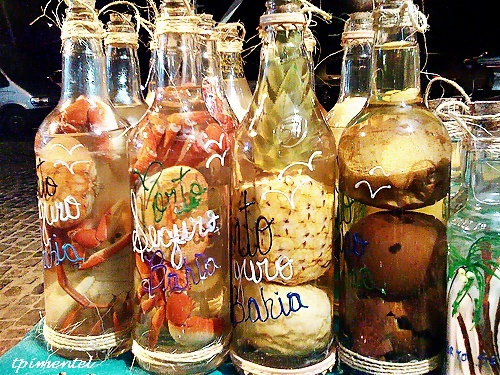 The liquid gold of Brazil….Cachaça. If you`re not familiar with cachaça i wrote a post about cachaça and rhum agricole long ago and tried to explain the difference between them since they both are made from sugarcane juice and yet so different. 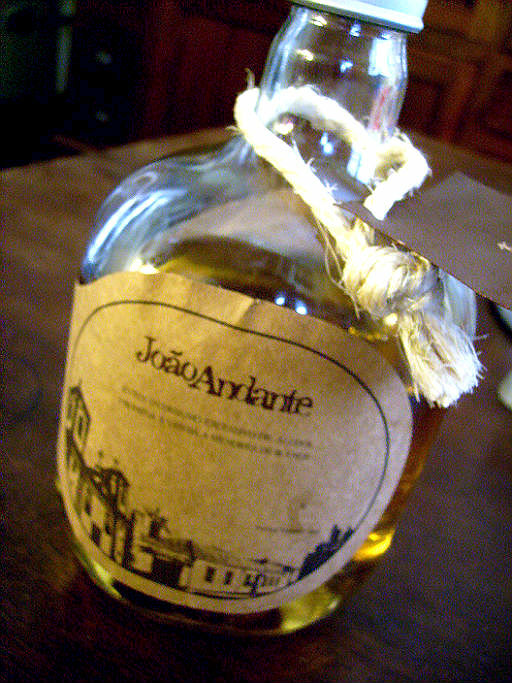 The cachaça i have here now, João Andante – is a handcrafted artisanal aged cachaça from Minas Gerais – and it tastes wonderful…..
Minas Gerais is the biggest and best cachaça producing state in Brazil and one can always expect a good selection of cachaças from people from Minas Gerais. 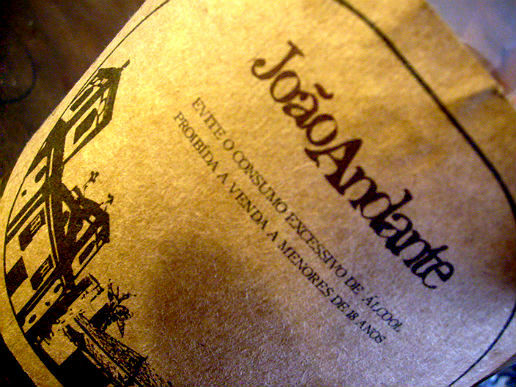 João Andante has a sweet sugarcane nose with grassy earthy notes and it tastes sweet, buttery and earthty, complex and very smooth – and it`s 40% ABV or 80 proof. It´s aged 2 years, one year in amburana wood and one year in oak. The amburana is known to give a light yellowish tone to the cachaça and so i guess the oak may impart some brownish/darker hues? There´s not much to read about this cachaça online so i have no real good info on it´s history or how it´s made. Seeing to that there are so many cachaças in Brazil i really would like to see more brands exported, as it is now only a fraction that gets out of Brazil. I`m lucky to have a brazilian friend and i can safely say that i wouldn`t have been able to try the great cachaças i have tried otherwise. I have actually only made caipirinhas with my João Andante because it really makes some killer caipirinhas….and just as with a classic daiquiri for real good rums – the simple combination of cachaça or rum and lime and sugar really allows the flavor of the spirit to shine through. It also is a very good sipping cachaça especially with that buttery aftertaste but to round this post off i also made a vanilla version of a caipirinha. The João Andante website is only in portugese unfortunately but there´s always google translate – but that doesn´t always get very accurate..
Cut a large lime into 8 wedges and put them in a rocks glass, add vanilla seeds and sugar and muddle. Add cachaça and crushed ice and stir well. 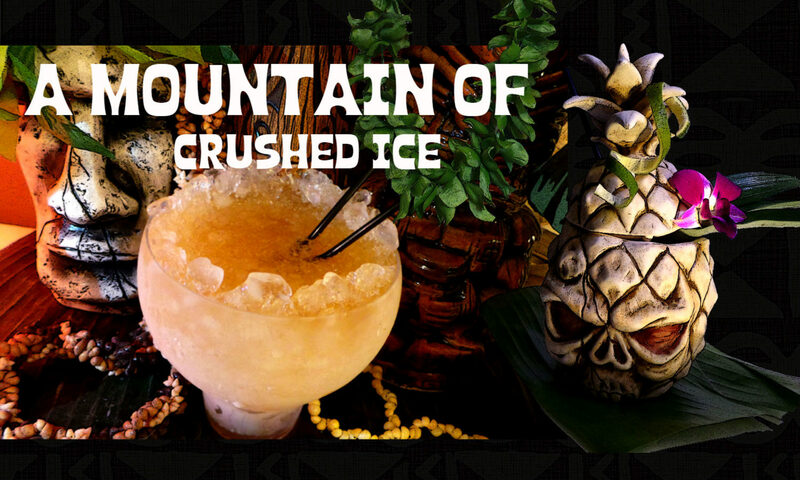 The crushed ice will melt a little and makes the flavors blend wonderfully. I like sugar rims so i used some molasses sugar mixed with some of the vanilla seeds to rim this one but that´s not necessary. Then i added a vanilla bean as garnish. Simple and good…this drink can of course be made with any good cachaça, preferably artisanal and i think aged goes better with the vanilla as both are naturally dark colored. Same as above but without vanilla bean. 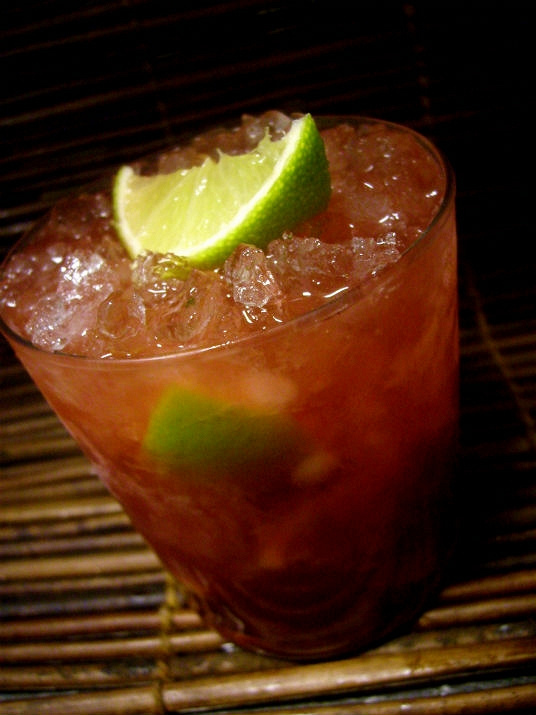 You may make all kinds of Caipirinha variations by adding fruits to the muddle. It´s such an easy drink to make and the key is good quality and fresh ingredients. 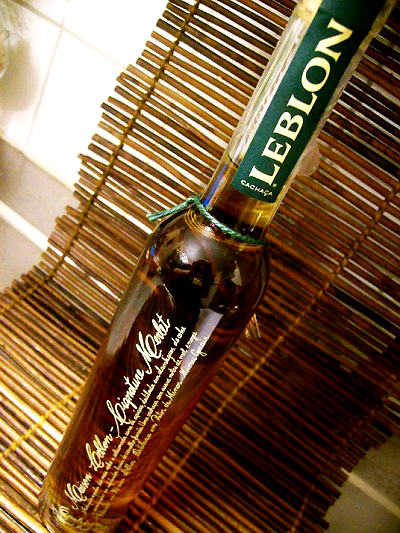 Last week I wrote about the Cedilla – and excellent acai liqueur from the house of Leblon and now it´s time to present their new aged cachaça as well – Maison Leblon Reserva Especial – a special limited aged cachaça that were recently introduced in Brazil. 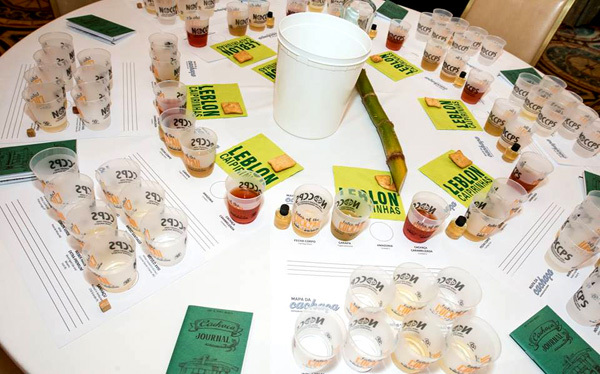 Leblon Cachaça recently won the best cachaça and double gold award at the 2012 San Francisco Global Spirits Competition with their Leblon cachaça and the new Reserva Especial. 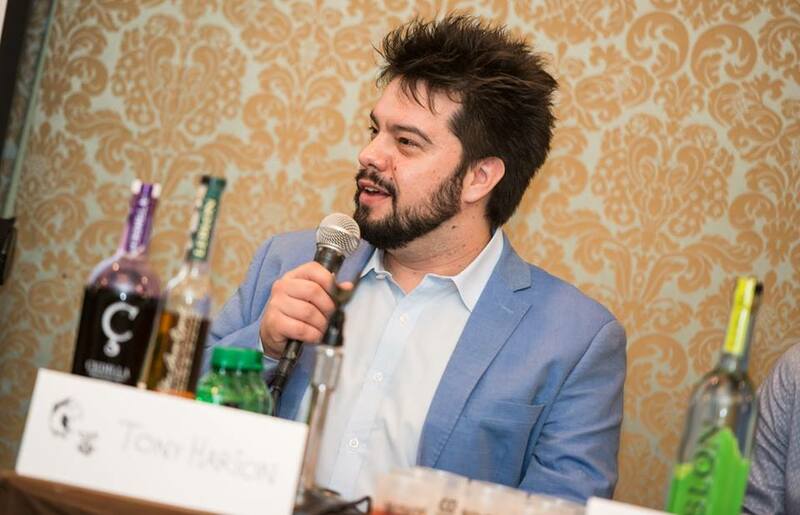 Cachaça has a more earthy taste compared to the more “grassy” rhum agricole – and both are delicious – I really enjoy mixing with them. The aged cachaça is more mellow than the white unaged and Leblon Reserva is aged in new Limousin French oak for two years and then blended by Gilles Merlet. Like Leblon, it is single batch distilled in alambique potstills. It has a complex smooth taste with notes of honey, sugarcane and something woody/nutty with a slight and pleasant “buttery” aftertaste. The nose is sweet and reminds me of sugar, earth and dulce de leche. The bottle is strikingly elegant with a thin slender shape and engraved handwriting on the glass and it contains 375 ml and is 42% ABV. In a Cocktail shaker, combine all ingredients except the rum and mint with ice, and shake vigorously. Strain into a large rocks glass fill with cubed ice, then add a ‘cap’ of crushed ice. 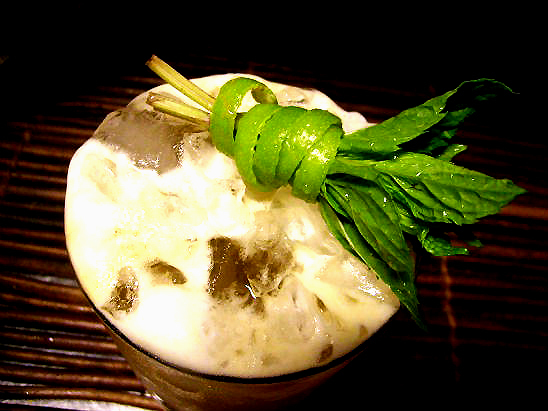 Float dark rum on the surface of the drink, and garnish with a mint sprig. As for spiced pineapple syrup – it`s not stated in the recipe what spices used in the syrup but since cinnamon goes well with pineapple i added some cinnamon to the batch. So you make a simple syrup (1.1 water plus sugar) and add a few pineapple chunks, 2 crushed (ceylon) cinnamon sticks and boil up lightly and then set to cool for a couple hours for flavors to marry. This cocktail was nice and a bit on the sour side, quite complex too – aged cachaça meets spiced pineapple syrup! Muddle pineapple chunks and honey, add the rest of ingredients and shake with ice. Strain into a chilled cocktail coupe and garnish with a raw-sugar rim, pineapple slice and cherry – or if you want it to look like it does in the picture – a dried pineapple slice and cherry. And that is very simple to make, I just sliced out a piece of the pineapple very very thin and placed it in the oven at 225 F ( 110 C) to dry for about 15-20 min or until the edges became partly browned. This cocktail was very nice and refreshing due to the earthiness of the cachaça and the freshness of lime and pineapple. 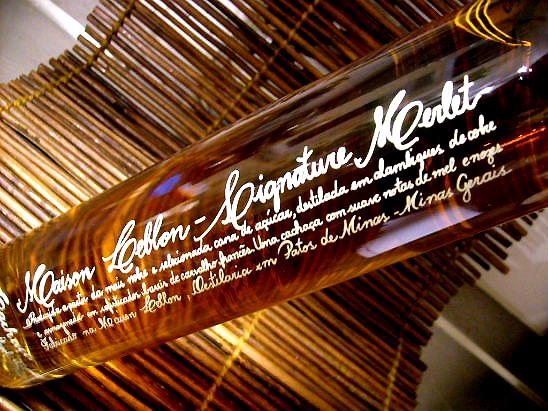 Maison Leblon Reserva Especial is currently available only in Brazil, and will be introduced shortly in limited editions to select markets outside of Brazil. So keep an eye out for it. Açai is a new macerated fruit liqueur made by Maison Leblon and is made from Zambazon açai berries from the Amazon region in Brazil. Straight from the rainforest, exotic and purple – yeah…this really speaks to me. 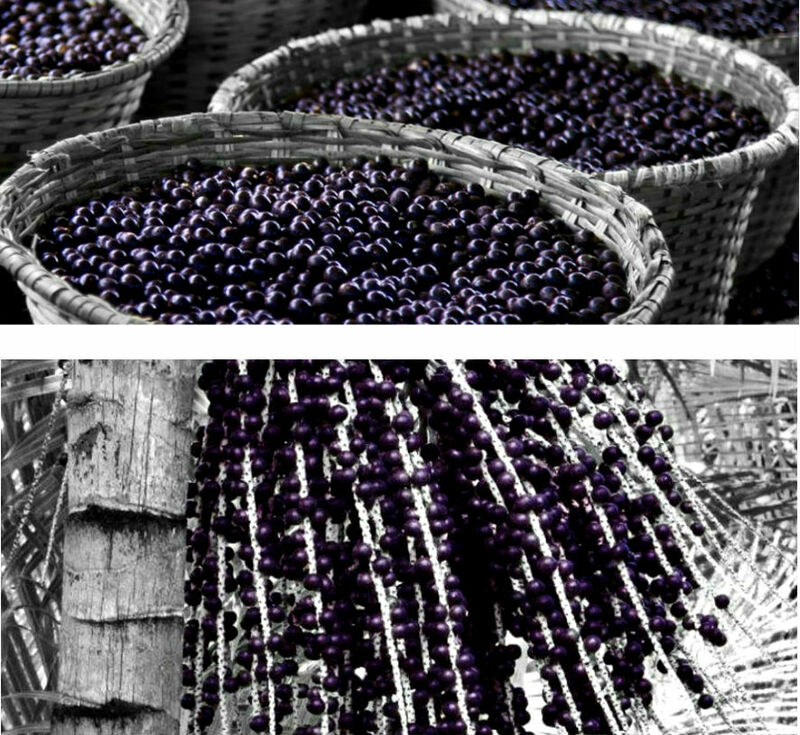 I “sort of” knew what açai berriers were ( i have heard about them in the context of heatlh) but i didn`t really know what they were and as usual when i get a sample of something new i start doing my reserach – so what exactly is açai berries? The word açai – means “the berry that cries” – they are glossy blue and purple berries from Brazil contaning LOADS of antioxidants. The berries are the fruits of a palm tree that grows slowly under the humid and shady rainforest canopy in South and Central America and take 4-5 years before producing fruit. The berry has a rich flavor similar to cherry with a hint of chocolate. The liqueur Cedilla is made with handpicked Zambazon açai berries and Zambazon means that they are certified organic & fair trade. The berries are macerated and blended with the highest quality alambique Cachaça from the Maison Leblon in Patos de Minas, Brazil. And what you get is a rich fruity flavor with complex chocolate, spice, and berry notes. It`s bottled at ABV 25%. Sounds good? well, it does to me….I was actually quite curious about the flavor of this product and disappointed i was not – instead i was rather surprised. It´s really yummy – fruity, complex, distinct and very much reminding of a finer ruby port. 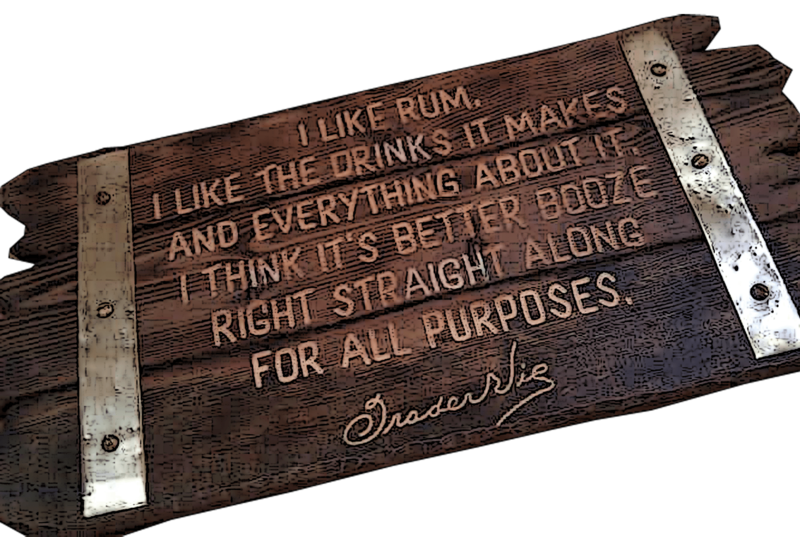 There´s great ways to use it too, it goes down nicely neat of course but my main interest is to use it in mixed drinks. Usually a good rule of thumb when it comes to local products is that they most often goes best together with other products from the same area or climate. So i went and searched for Brazilian recipes to either use as is or tweak a little bit to create something new. But you also need to step outside the boundaries sometimes how else shall you discover something different and exciting? and to me – of course you can use this in tiki drinks too – you can use it in everything – despite that not being very Brazilian…but believe me i`m gonna try that too. But the first drink that comes to mind when thinking about Brazil just has to be the caipirinha and mixed with cachaça, sugar and lime how can it be anything but glorious? Muddle the limes and fine sugar or sugarcane syrup in a mixing glass. 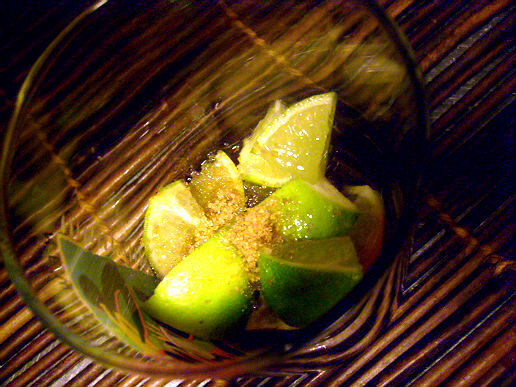 Add Cedilla and Leblon Cachaça. Fill with ice, shake well and pour all into a rocks glass. Garnish with a lime wedge. Combine all ingredients in shaker and shake vigorously with ice. 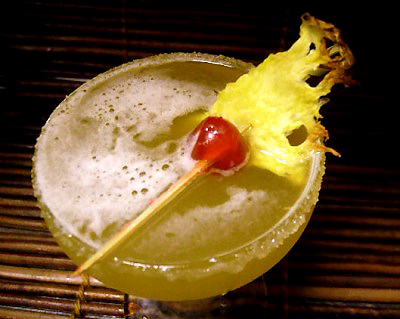 Strain into a highball or other glass filled with cracked ice, and garnish with a pineapple slice. Oh this is yummy…this cocktail has a quite mature taste, it´s semi-sweet and there`s lots of “port” flavor in it from the Cedilla but also somehow the ginger flavor marries into it and makes the impression stronger. An interesting variety would be to muddle fresh ginger into this instead of the liqueur. This is a sip and savor kinda cocktail. And now it´s time for a tiki drink as well and since Cedilla has a taste of a light ruby port i think it would be interesting to make a twist of Martin Cate´s “Dead Reckoning” and switch the tawny port for Cedilla and the rum for aged cachaca and a high proof dark rum with attitude like Smith and Cross. And finally switch the angostura bitters for one – just one dash of Mozart chocolate bitters…. Well well well…..this was a DRINK!! very strong, very spicy…with that hint of chocolate…just the way i like it! when the ice dilutes it just a little bit it becomes perfect! 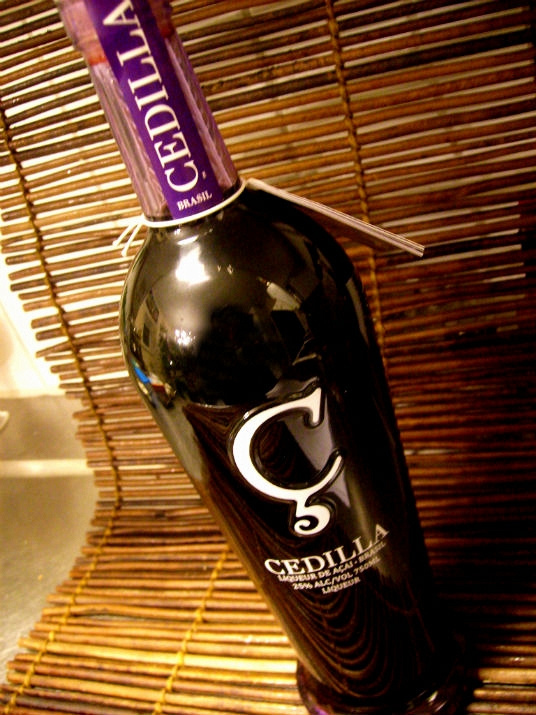 I have to say that Cedilla acai liqueur is a very good liqueur indeed…and you can do a lot with it – it fits in most styles of cocktails – go get it! 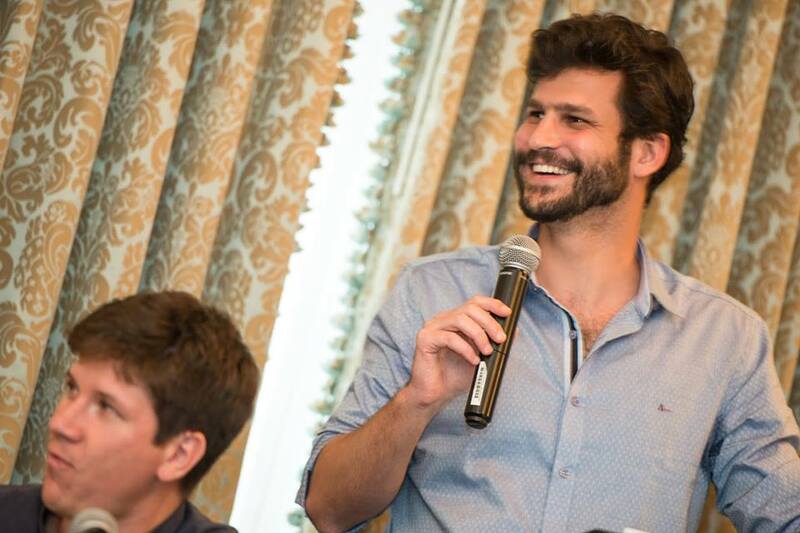 I don´t know where it´s sold right now outside of Brazil or if it even is but you may contact Leblon to find out. I really like the Cedilla! it´s tasty, versatile, exotic and warm! On a sidenote – the word Cedilla is from the Old Spanish name for the letter, ceda (zeta) A cedilla – also known as cedilha or cédille, is a hook ( ¸ ) added under certain letters as a accent mark to modify their pronunciation. In this case it becomes a “soft” c.
Pictures of acai berries at the plantation are courtesy the House of Leblon. Green chartreuse is really something – its the elixir of pure pleasure! a little of it and its like magic drops transforms an average drink into a potion of dreams.. This magic potion made by the Carthusian Monks since the 1740s and composed of distilled alcohol aged with 130 herbal extracts can really make you smile.. This fantastic liqueur is named after the Monks’ Grande Chartreuse monastery, which is located in the Chartreuse mountains in the general region of Grenoble in France and is one of the few liqueurs that improves with age in the bottle. A tasty blend of aged cachaca, fresh lime, acacia honey-mix, sugar cane syrup and green chartreuse…shaken with cracked ice and what do you get? well – its a hybrid of the Pineapple Delight and the Chartreuse Swizzle..and it`s one heck of a refreshing cocktail. In the Mixohouse in New Orleans this summer, we served green chartreuse swizzles in flower vases with a bunch of straws so everybody could get their sip of the magic potion. This drink is actually addictive – in a good way. 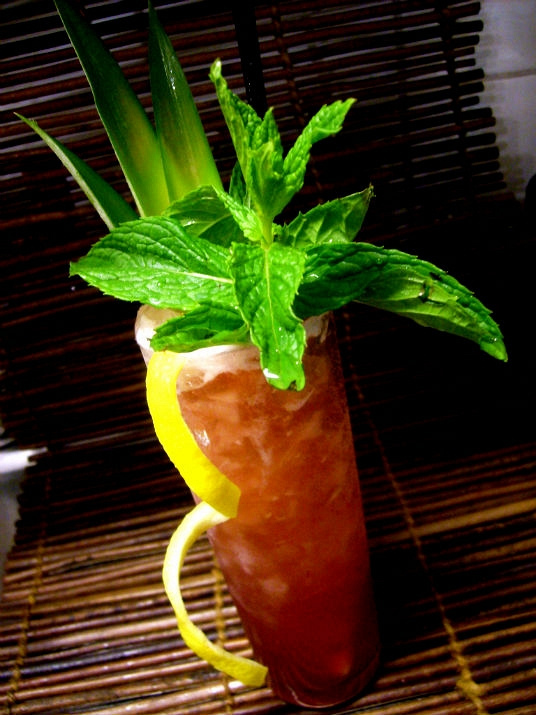 It blends especially well with dark rum, JWray, aged rhum agricole or aged cachaca (haven´t tried tequila yet..) pineapple and mint. Also a splash of the raw cocoa flavored chocolate spirit Mozart Dry makes wonders in it. The Pineapple Delight has the rhum agricole, JWray and honey-cream-mix and the Chartreuse Swizzle the green chartreuse, falernum, and rum..both has pineapple and lime – and now we have a mix of the two with aged cachaca as the base spirit and where the green chartreuse act as a float. I shall confess that i could drink bucket loads of this if only my body could cope with that. But of course that won´t work so i settle with two this time. After all the chartreuse is a strong potion. 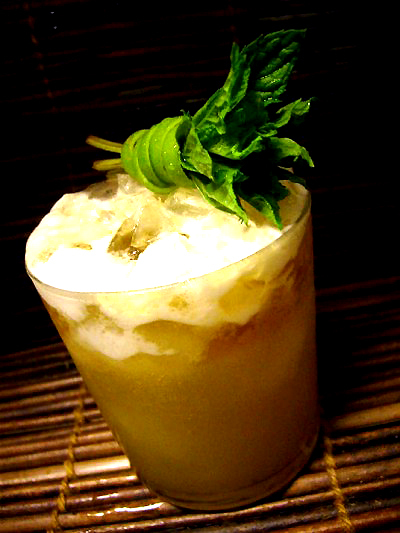 Shake with cracked ice and strain into a highball filled with crushed ice and garnisih with mint. Float green chartreuse. 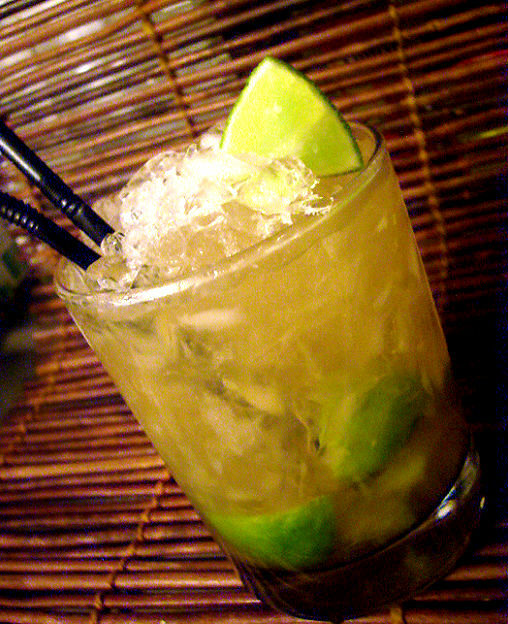 Whatever cachaca you may use – I have noticed that the choice of cachaca in this drink is of utmost importance. Premium aged cachaca – nothing else will do. If you use Rainhas (i believe this may be for some of the cocktail bloggers) you´ll notice that after the herbal flavor of the chartreuse, there´s a very pleasant buttery aftertaste. Otherwise i think Abelha Gold is a good aged cachaca. A year ago i wrote about the Abelha organic cachaca and tried out their silver which I liked a lot. 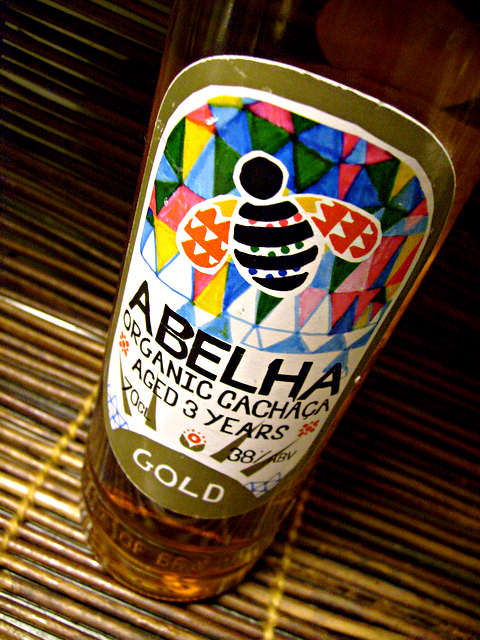 Now its time to try out their aged cachaca – Abelha Gold. 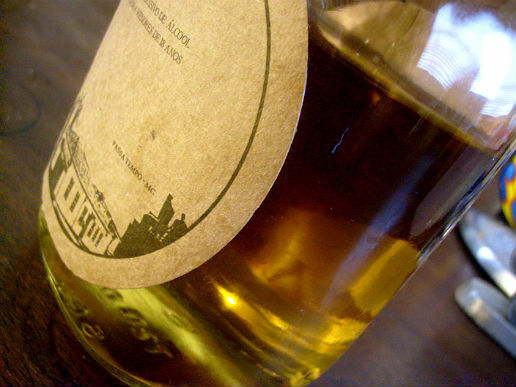 Abelha is a small batch organic cachaca and thus contains no chemical products. 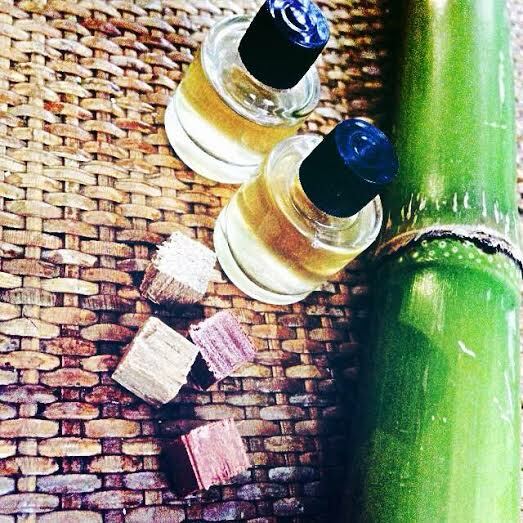 From the green sugar cane the natural yeasts are used for fermentation and the farmers in Bahia where Abelha is made grows 100% organic sugarcane which isn`t burnt ( a requirement for beeing called organic) and is distilled in small batches in traditional copper stills. Abelha Gold is aged for 3 years in small 250L garapeira wooden barrels – and this species of wood which is native to Brazil does not change the flavor and character of the cachaca in the same way as an imported oak barrel does – instead it imparts a unique honey and spiced note to the spirit paired with a beautiful mellow tone resulting in a flavorful well-balanced cachaca. 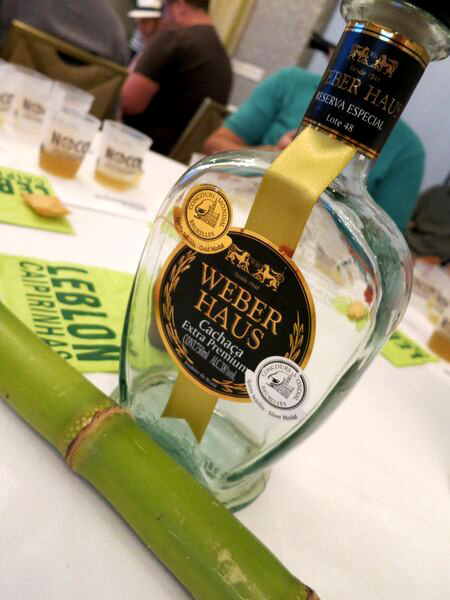 The flavor has hints of dried tropical fruits, honey and vanilla and has a woody character…slightly topped off with the typical grassy notes of fresh sugarcane. Its on the sweet side but not too much. The nose is woody/grassy. The cool lively and colorful bottle labels makes me happy and are made by Holly Wales and Anthony Sheret. I really would like to see this cachaca sold outside of the UK…more people deserves to taste this good stuff! let`s hope for that it will in a not too distant future. At the back of the label it says – Drink responsably – this cachaca is too good to mess about with. That`s a good advice..and now its time for a cocktail…I`m in a pineapple mood so a little twist on the Pineapple Delight is in order and really, this cachaca is made for that kinda drink. Scoop out a pineapple and set aside and save a few leaves for garnish and a pineapple slice. Don´t scoop too deep as it will leak. Before serving fill it up with crushed ice. Muddle pineapple chunks, vanilla honey and lime in shaker. Add Abelha cachaca and shake with ice and strain into the pineapple filled with crushed ice and top with Ting, then float Smith & Cross. Finally garnish with the pineapple leaves, slice and a wedge of lime, make sure these don`t touch too deep so the drink doesn`t become bitter. This drink is so TASTY! please try it! I also wanted to try out the Golden Fashioned from Detroit Bar in Covent Garden but that drink contains smoked sugar and since i have no equipment for smoking sugar i leave that for those who can. But here`s the recipe. Abelha cachaca is certified by the IBD in Brasil, and the UK import is certified organic by the Organic Farmers and Growers. 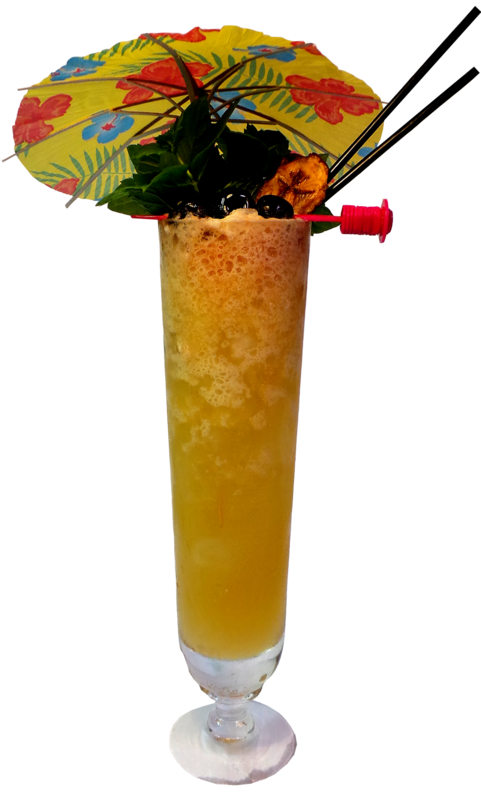 Here are three New Year tiki drinks to imbibe at the end of this year (and thereafter) Thanks for reading my blog and commenting on my posts which helps keeping the blog alive. I`m happy to now be on the right side of the year soon – now we move towards spring and summer again even though very slowly..so here its not going to get any darker but slowly lighter, but i won`t see any change until beginning of march. For the moment it gets dark around 3pm. 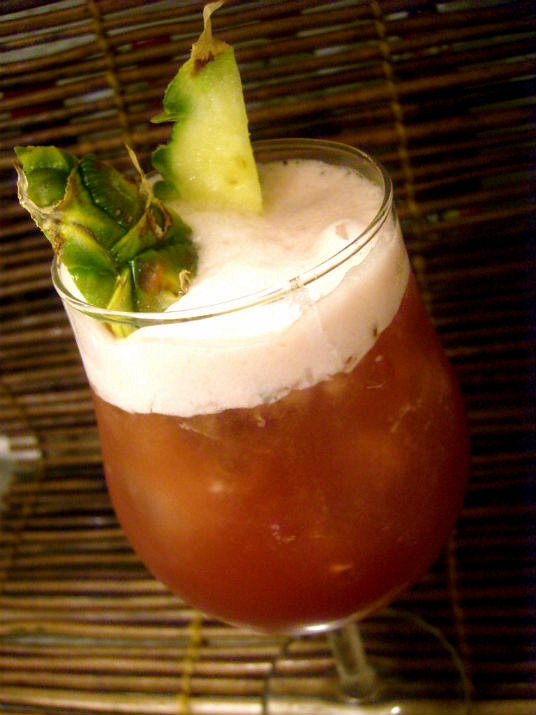 I hope to mix many many drinks in the year to come..
Garnish hibiscus sugar rim, pineapple leaves and slice. Crush dried hibiscus flowers into a fine powder and mix with a golden fine sugar. 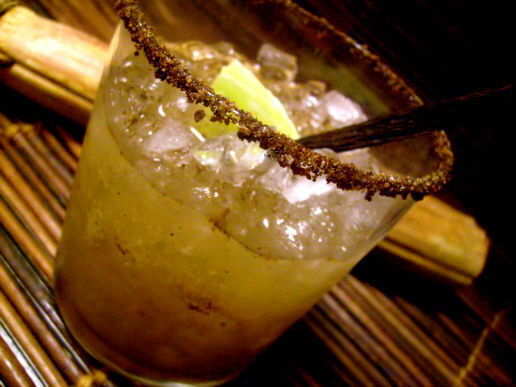 Rim a tall glass and fill up halfway with crushed ice – carefully to not ruin the rim, Muddle pineapple, cinnamon, honey and lime in a shaker, add cachaca and ice and shake well. Double strain into the glass, fill up with some more crushed ice and top with a little bit of champagne. Rim the glass with golden fine sugar and fill up halfway with crushed ice – carefully to not ruin the rim,.Shake ingredients and strain into the glass and add more crushed ice to fill Garnish with a few citrus leaves. Rim the glass with cocoa powder, fill up with crushed ice. Shake ingredients except the champagne and strain into the glass. Carefully add more crushed ice to fill and top with a little champagne. Happy New Year and Okole Maluna!